Nebulae are a favourite target for Hubble. Their colourful plumes of gas and fiery bright stars create ethereally beautiful pictures. Some of the most famous of Hubble's images have been of nebulae — for example, the telescope's 22nd and 23rd anniversary images of the Tarantula (heic1206) and Horsehead (heic1307) nebulae, and its festive 2012 image of planetary nebula NGC 5189 (heic1220). 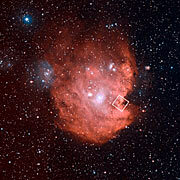 The nebula is a violent stellar nursery, packed with the ingredients needed for star formation. However, the recipe for cooking up new stars isn't very efficient and most of the ingredients are wasted as the cloud of gas and dust disperses. This process is accelerated by the presence of fiercely hot young stars which trigger high velocity winds that help to blow the gas outwards. A vibrant palette of colours can be seen in this new image of NGC 2174. Dark brown and rust-coloured dust clouds billow outwards, framed against a background of bright blue gas. These striking hues are formed by combining several Hubble images taken with different coloured filters, to reveal a broad range of colours not normally visible to the human eye. The icing on this cosmic birthday cake takes the form of young white and pink stars sprinkled amongst the glowing clouds, pushing away the dark stellar nurseries in which they formed. 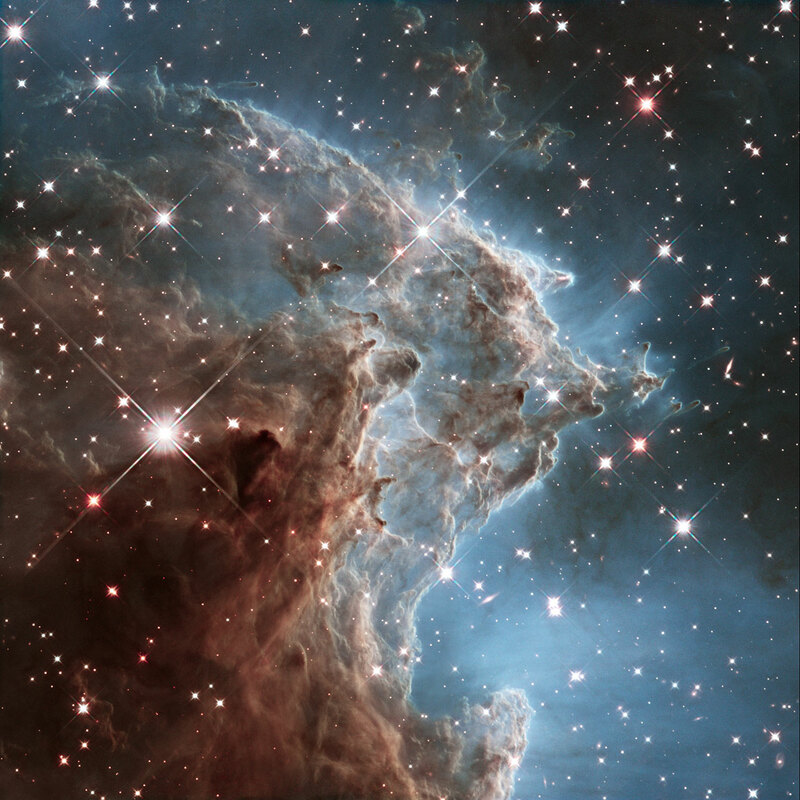 The key ingredient in NGC 2174 is hydrogen gas, which is ionised by the ultraviolet radiation emitted by the young stars. 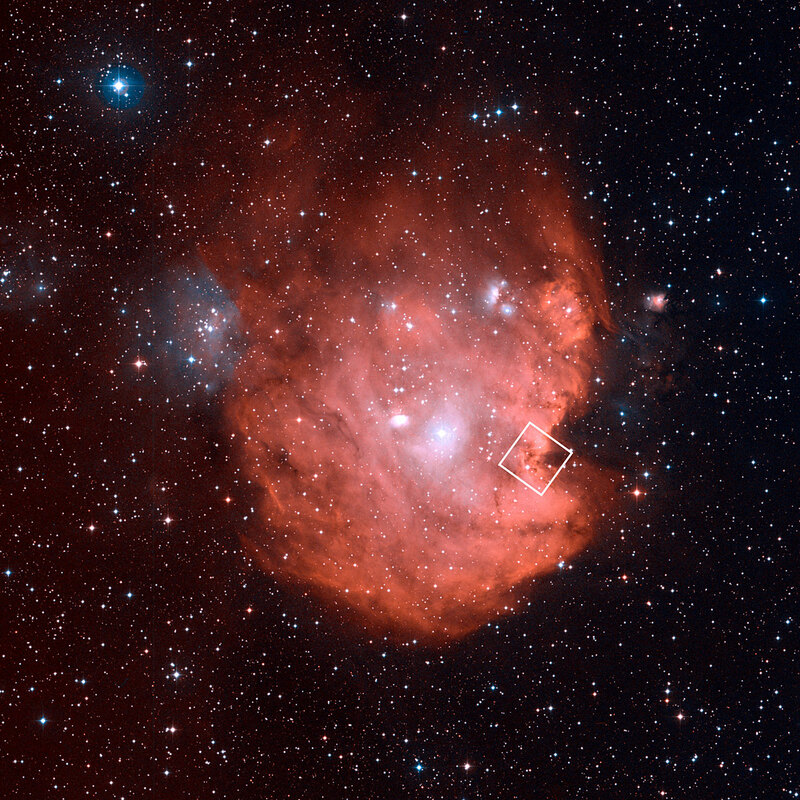 As a result, this region is also known as an HII region  — a large cloud of ionised gas. This image marks 24 years of Hubble. This milestone will be further celebrated by a conference being held in Rome, Italy, in March of this year. The conference, entitled Science with the Hubble Space Telescope IV, will highlight and celebrate the scientific breakthroughs that Hubble has made over the last two decades and look into the future at the topics and key questions that will shape the field of astrophysics in the next decade. 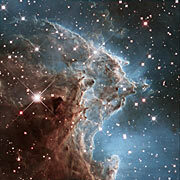 This portion of the Monkey Head Nebula was imaged in the infrared using Hubble's Wide Field Camera 3. Hubble's earlier Wide Field Planetary Camera 2 image from 2011 inspired its choice as the telescope's 24th anniversary image. 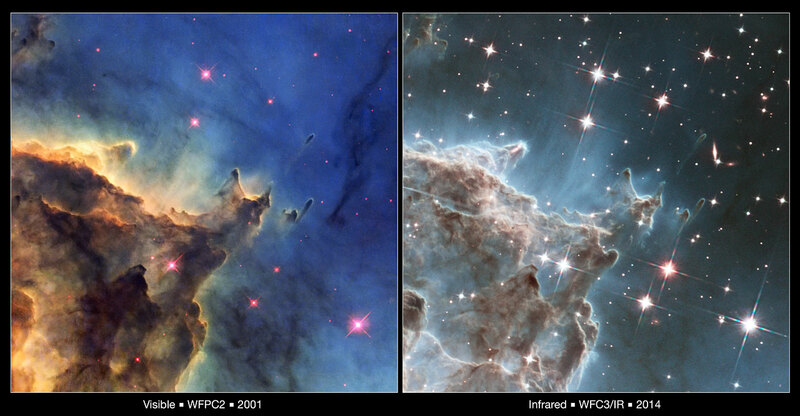 A processed version of the WFPC2 dataset was entered into the Hubble's Hidden Treasures image processing competition by Yurij Tukachev. An HI region (pronounced "H-one") contains a lot of neutral hydrogen, an HII (pronounced "H-two") lots of ionised hydrogen, and a H2 region molecular hydrogen.